Then there are those days when I just fall short and can’t seem to put ideas together or when I don’t have the energy to whip something up. Whatever the reason, sometimes it just happens. Over the summer, I was privileged to watch my daughter and a few of her teammates find inspiration/motivation in each other while training for the upcoming soccer season. They found each others’ strengths and focused on them to push through points of exhaustion or pain. Because I saw my daughter pushing herself to sometimes uncomfortable moments, it inspired me push through when I was having one of my ho-hum type of days. The girls’ routine for a certain day was to build endurance, so they hit the trails for a run. I took my own words of wisdom and I joined them for the run. I gave the girls a head start, and then set out on my first run. Well…truly it was more like a light jog/fast walk. The wet Ohio weather left the trails muddy at a few points. There were steep inclines, tree roots, fallen trees, and narrow wooden plank bridges to challenge my pounding heart, excessive breathing, and slightly numb toes. It was “mind over matter” big time! My ho hum day turned into a day filled with productive musings, like what to highlight next here on KM. Zucchinis came to mind that day in the woods. It’s random, I know. Just go with it. You’ll see! Zucchini is one of those vegetables that a lot of people turn their noses up at. I’m not sure if it’s the texture or the bland taste. Who knows! But what I do know is this is the time to push yourself and take on this zucchini recipe so you to can discover just how good this green oblong vegetable can taste. 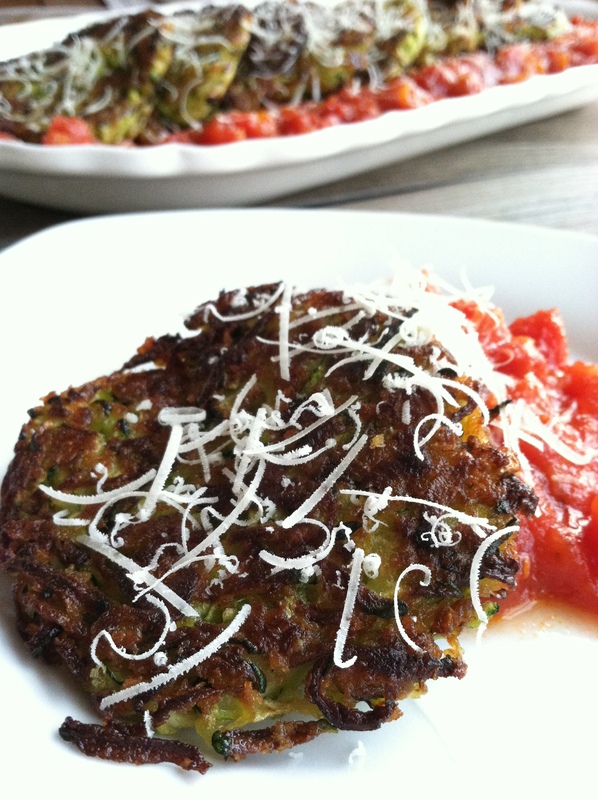 With the zucchini shredded and fried just enough to give crisp edges you will become a zucchini lover. Ok, maybe lover is pushing it a tad, but you will definitely enjoy these. The Diavolo sauce is the perfect complement. For those of you that already enjoy zucchini this will be your new go-to recipe. It ‘s fast, easy and keeps well in the fridge. I almost always double the zucchini cakes recipe. There are times when I don’t fry all the cakes. My daughter likes these so much that I leave some for her to fry fresh the next day or two. Just make sure you drain the mixture well. My husband also uses leftover cakes as the “bread” for fried egg sandwiches the next morning. The Diavolo sauce is fine as a single recipe. There will be plenty if you decide to double the zucchini cake recipe. Tip: These cakes will have the best texture if you shred chilled zucchini using the large holes of a box grater. Shred zucchini down one side until you reach the seeds, then rotate to other side. Leave skin on the zucchini for color. Strain shredded zucchini and onion in a salad spinner to remove excess moisture. Transfer vegetables to a large bowl; stir in Panko. Whisk together egg, salt, and baking powder in a small bowl; stir into zucchini mixture. Heat oil in a nonstick skillet over medium heat. When oil is hot, drop mounds of zucchini batter into skillet using a 1/3-cup measure. Slightly, flatten the mounds into cakes using the bottom of the measuring cup. Fry cakes until golden, about 4 minutes per side. Transfer cakes to a paper towel- lined plate. To serve, divide Diavolo Sauce between plates, and top each with two cakes or double the recipe and serve on a large platter. 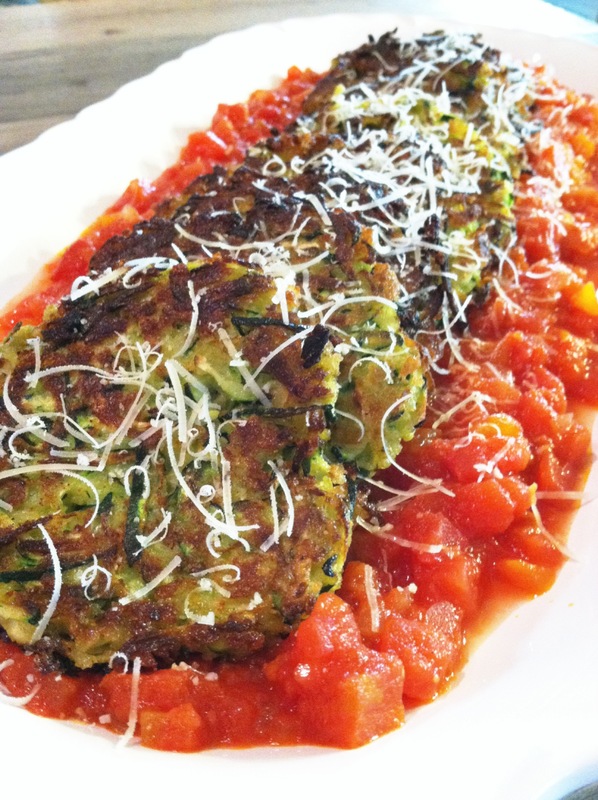 Garnish zucchini cakes with parmesan cheese. Tip: I use a small can of tomato paste. Put the leftover paste in a ziplock freezer bag and freeze for later use. Saute onion and bell pepper in oil in a saucepan over medium-high heat for 3 minutes. Add tomato paste and garlic; cook for 1 minute. Stir in wine, tomatoes, vinegar, and pepper flakes. Simmer sauce for 5 minutes; season with salt. Sauce can be served warm or at room temperature.